The United States, since the times of the “Great Society”, has spent approximately 24 trillion dollars on anti-poverty programs, while the percentage of those considered to be in poverty has remained the same. With a 50 year track record as evidence of the utter failure of the welfare state, it amazes me that the public continues to buy into this form of wealth re-distribution. It probably makes them feel good- they are doing something about poverty, by voting for people who promise to do something about poverty! Who wants to feel bad? And you call it an utter failure, but politicians can talk about how much worse things could be without the government assistance! Can you prove them wrong? Feeling good, virtuous, if you will, about “helping the poor” is impervious to facts. Not to mention all the votes that $24 trillion bought. The precise enumeration of “the percentage of those considered to be in poverty” is up for grabs, whilst the number 24 trillion is quite specific. I’ve been reading this blog with enjoyment for some time, and I’ve never come across anything so idiotic. And whilst I’m not asserting that governments create wealth, I venture to suggest that libertarians should not create statistics. Some of the statists had good intentions – but some (such as Cloward and Piven) had evil intentions – to deliberately create a dependent underclass as a POLITICAL tool (and to undermine civil society – “capitalist” society). Also the post (good though it is) leaves out a vital fact – before the “Great Society” Welfare State poverty was declining (it was falling). It is not just that the American Welfare State has done no good – it is done harm, terrible harm. What makes the collectivists think that collectivism has not been tried in America? It was tried at the very start – the “Pilgrim Fathers” tried it (communal land ownership and all the rest of it) and half of them starved to death before the experiment was abandoned. Yet people are just told that “the Indians saved them” (saved them from what?). And if we are talking about Indians – what about the reservations? These are socialism in action – communal land ownership, income support, government health care and so on (everything). South Dakota has lots of jobs (skilled and unskilled) people come from thousands of miles away to gain employment – yet on the Indian reservations there is mass unemployment. “Racism” – for unskilled jobs that employers can not fill? Pull the other one – it has got bells on. “It is because the white government is in charge”. Elected Tribal Councils have been in charge for many years – the white man is only in charge of Indian reservations in Hollywood fantasies. When Indians are allowed to own land as INDIVIDUALS and are free of welfare they are like anyone else (back in the 1930s the New Dealers in the Bureau of Indian Affairs thought the Indians were too “individualistic” and should be more “communal”). This is nothing to do with race – it is socialism. Socialism does not work – look at an Indian reservation (or so many other examples) and see. And, no, after more than 150 million murders by the socialists in the last century (see “The Black Book of Communism” and many other works) I am not prepared to accept that the “Critical Theory” university crowd do not know this. I think that’s a tad unfair. The measures of poverty usually quoted for the U.S. exclude some non-cash benefits, such as health care and food stamps, and there is a good argument that if these are included then there is virtually no real poverty, certainly by world standards. I believe that the majority of the U.S. ‘poor’ have cellphones, cars, air-con, etc etc, and eat pretty well (OK, given U.S. diets, maybe I should say “can afford to eat enough”). I have also seen a claim that the average “poor” American has more living space per person than the average European, which I don’t find implausible. I’m sure that the U.S. tax and benefits system is wasteful, inefficient, unfair and full of lousy incentives, but the country is wealthy enough to still provide everybody with enough to live on. Isn’t the real story that free-market capitalism is providing so much wealth that you can have a massively dysfunctional government and still be able to support everybody? Ian- While the figure of 24 trillion dollars is arguable, what isn’t arguable is that despite all this re-distribution the percentage of those considered to be in poverty has remained consistent. I obtained that figure through various sources, and because of the duplication of various programs, and the inability to properly audit all these programs, the actual figure is arguable. Perhaps this article might shed light on the problems with finding an exact amount. The fact though that such programs are failures, at least from the point of view of intended results, indicates that to continue down such a path amounts to a form of insanity. Whether or not 16 or 24 trillion dollars is the actual figure obscures the fact that any of those amounts is far too much, considering the results. There is a better way. Paul- I appreciate your reference to Cloward and Piven. They are given much attention by those who are in charge of the many programs of wealth re-distribution. I don’t think anyone could argue against the conclusion that a permanent dependent class is the goal of these statists, since it guarantee’s them power over everyone in support of their ideology. Personally, I am distressed that so many are willing to give up their sovereignty for so little, and to become so dependent they will vote those in power who promise them more, and more. Theft has become a virtue to some. Clearly, if $24 trillion did not abolish poverty, it was not enough. We ought to try spending $48 trillion and see how that works out. Fair point, Ian, but the fact is that the number of people considered to be in poverty by the people pursuing the war on it hasn’t changed since it started. In other words, they’re not our statistics; they’re their own. Which suggests one of two things, neither particularly savoury for the poverty warriors: either they’ve totally failed, or they are manipulating the statistics in order to continue a campaign that, nowadays, chiefly benefits themselves. Where has all the money gone in the “War on Poverty”? There are many thousands of very wealthy bureaucrats, generated and financed by said War. There are, additionally, hundreds of thousands of less wealthy bureaucrats, but still with comfortable lifestyles, financed by said War. Which contributes to Washington, DC being the richest region in the USA. Hasn’t washington become a black reservation? Except for the actual political offices (Congress, the Supreme court, etc. ), aren’t most capital-dwellers of the African-american faith? Does any of the bureaucratic wealth filter down to them? Nick, no it doesn’t “filter down to them”. But it does percolate out into the (mostly white) suburbs in Virginia and Maryland, which comprise some of the wealthiest MSAs in the entire country. 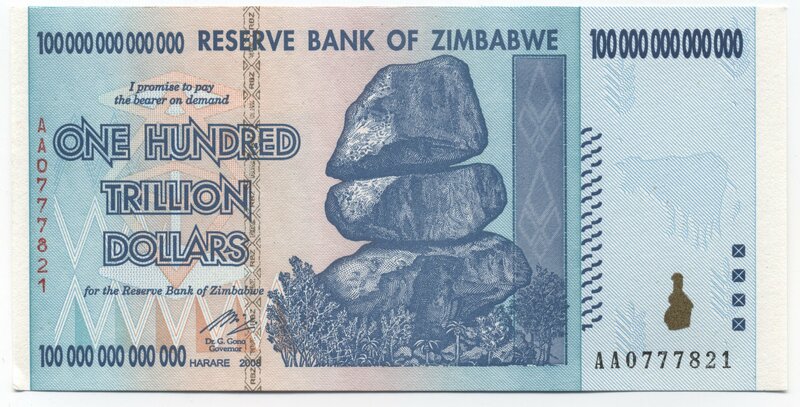 John K, you are a meanie, I bid $96,000,000,000,000, in one go, that’ll sort it, but I only have $100,000,000,000,000 Zimbabwe Dollars to spend, say you keep the change? I suppose that the big question is that if $24,000,000,000,000 had not been spent on ‘poverty’ (and let’s face it, they bought plenty of it) would the various Congresses, which towards the end might have had different compositions, simply have found some other ways to waste it? If you notice when the UK media complain about waste of taxpayers money, they tend to say ‘That could have paid for x nurses or y schools.‘ rather than that it should have stayed in the hands of the taxpayers. No real poverty in the United States? An astonishing statement – refuted by five minutes walking in certain areas of any major city. Remember a lot of these people are state “educated” (at vast expense) – they are unable to fill in the forms for X, Y, Z (because they can read them). In the old days they would have been in low paid jobs – but the minimum wage laws make those jobs illegal. And they would have lived in bad conditions – on “skid row” (many famous Americans had parents who lived on “skid row” – that sort of social mobility is almost impossible now). Now skid row has been bulldozed (“The Federal Bulldozer”) so they sleep in the streets – and people without an address have lots of problems in relation to work (and everything else). So they turn to drink and drugs to dull the pain (people can always find money for drink and drugs) and then insanity claims them. The insane people on the streets often did not start out insane. Higher up the social scale people are outcompeted by “college boys” – not because the university graduates are better at their jobs, but because government regulations (and the atmosphere they create) give rise to expectations of a certain sort of person – a certain way of running a business. So “working your way up from the shop floor” (“college boys” were a rarity before the Second World War – in many lines of business) is now rare. And one needs to be a lawyer (or understand lawyers) to be top manager anyway (because of the endless regulations) – so that means Law School after ordinary university. Welcome to the TRILLION Dollar student loan debt – and to non university people (the “drop outs” who have been a success still went there – and tend to be from wealthy families, networking) having little chance. The “system” is unfair – but not in the way the left says it is. Virtually everything is “licensed” and subjected to other regulations these days – and form filling and expense is lethal for the poor. If you notice when the UK media complain about waste of taxpayers money, they tend to say ‘That could have paid for x nurses or y schools.‘ rather than that it should have stayed in the hands of the taxpayers. An excellent point, and one which annoys the hell out of me too.